John N. (Nick) Fountain, shareholder at Young Moore, was presented the Administrative Law Award For Excellence last week by the North Carolina Bar Association Administrative Law Section in conjunction with its annual meeting and CLE. Nick is the third recipient of this award. 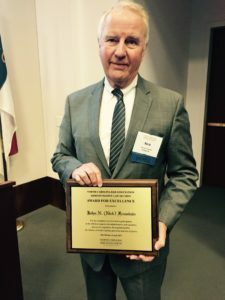 He is a past chair of the Administrative Law Section, a former member of the NCBA Board of Governors and NCBF Board of Directors, and has provided leadership to numerous committees, including the Endowment Committee, where he has served for 15 years.